Are you looking to buy computer components online at the cheapest prices? If so, you have come to the right place! 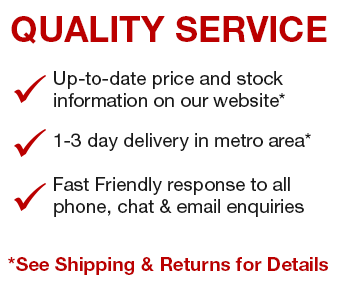 MegaBuy is where you will find the cheapest computer components in Australia. We have over 20,000 items in stock and will BEAT any competitors' prices on any computer components we have in stock. The following steps provide you an overview of how to buy computer components online at MegaBuy. If you are an experienced online shopper and already know how to buy computer components online, please use the column on the left to find the computer components you desire by searching or browsing by category or manufacturer. For the latest promotional offers and featured products please visit the MegaBuy Online Computer Store Homepage. Once you have found the Computer Components you want, click the "Add to Cart" button either in the Product Listing or on the Product Details page to add the Computer Components to your Shopping Cart. Once you have added all the Computer Components you want to your Shopping Cart, click the "Checkout" button to check out the Computer Components from your Shopping Cart. The first step in the checkout process is to check the Delivery Address for your Computer Components Order and select a Shipping Method. You can change the Delivery Address at this stage and select a Shipping Method if there is more than one Shipping Method available. Currently we only offer Courier Delivery by Air/Road Freight. At this stage you can also choose to purchase Shipping Insurance to better protect the computer components you ordered in transit. If you have chosen to pay with Credit Card, you will be required to enter your credit card details at this stage, but your credit card will not be charged until you have confirmed your Computer Components Order. Once you have selected the Payment Method (and entered your credit card details if you are paying by Credit Card) you get a chance to review your Computer Components Order before you confirm it. To place your Computer Components Order, click the "Confirm Order" button. Once you have placed your order for computer components with us, you can track the progress of your Computer Components Order with us via the "My Account" page.